On the 28th and 29th of November this year, millions of people worldwide will take to the streets in the world’s largest ever mobilisation on climate change. Because of the way time zones work, New Zealanders will be the first to march. It’s an opportunity for us to get together with friends and family and lead the world in demanding action on climate change. Thousands of New Zealanders have already pledged to march. Forest & Bird is joining with other groups to organise non-partisan family-friendly People’s Climate Marches all over NZ. It’s important to us because climate disruption threatens nature as well as people. You can RSVP now. According to the State of the Environment report recently published by Statistics New Zealand and the Ministry for the Environment: 81 percent of bird species that breed in New Zealand are facing extinction. So are 72 percent of freshwater fish, 88 percent of reptiles, all of our native frogs, and 27 percent of our resident marine mammal species. Climate disruption will exacerbate this situation by reducing the habitats available to many native species, increasing the potency of existing threats and changing the behaviour and physiology of native species. Coastal ecosystems will be squeezed between rising sea levels and human infrastructure. High alpine plants that grow only on New Zealand’s highest peaks may be lost as lower altitude plants and habitats move uphill. Pests and diseases will spread southwards putting even more pressure on our native forests and wildlife. More extreme weather events could destroy habitats through flooding, drought and erosion. At 4 degrees warming, tuatara may go extinct from a lack of males for breeding. Even the oceans aren’t immune. Changing ocean currents and warmer seas are likely to deprive native seabirds – like albatross and penguins – of food. What’s more climate change’s evil twin, ocean acidification, would wipe out corals, shellfish and all other marine life that relies on calcium carbonate shells. Ocean acidification occurs when excessive carbon dioxide dissolves in the ocean and changes the chemistry of seawater, increasing its acidity. This dissolved calcium carbonate shells in the same way that carbon dioxide dissolved in rainwater dissolves the marble and limestone in many parts of New Zealand to create caves. Unfortunately, the same process that creates wonderful features on land will kill life in the sea. All good reasons to get behind the biggest climate change mobilisation in history. The march is timed to happen one week before 197 countries meet in Paris to decide on joint action to tackle climate disruption. Prime Minister John Key and Climate Change Minister Tim Groser will be attending the Paris negotiations. So how well is New Zealand doing? Badly it seems. The Government’s current approach to the climate change negotiations is like underarm bowling – twisting the rules instead of playing the game. Four independent research institutes assessed the target New Zealand is taking to Paris and concluded that we can achieve our target without any further work to cut emissions because of the way New Zealand wants the international rules to work. That’s not cricket. The New Zealand Youth Delegation to the Paris talks have made a quirky little video about New Zealand’s lack of a plan to cut emissions. You can also see how New Zealand is faring in the Climate World Cup. This website rates New Zealand’s performance in tackling climate change against the countries that the All Blacks play. Unsurprisingly, while the All Blacks are poised to win the Rugby World Cup, New Zealand is badly losing in the Climate World Cup. Thankfully you can do something about this by joining the marches around New Zealand on 28 November and calling for solutions not pollution. There are now climate march events organised for: Auckland, Wellington, Marlborough, Nelson, Whanganui, New Plymouth, Christchurch, Palmerston North and even Raoul Island in the Kermadecs! Thousands of New Zealanders have already pledged to march, which People’s Climate March are you attending? RSVP now! 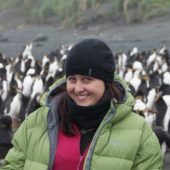 Kimberley is a science communicator and conservationist based in the South Island of New Zealand. There will be a Climate March in Wanaka on Sunday the 29th November, starting from the Dinosaur Park at 2pm. See you there!